Travel a few hundred miles south and you are bathed in warm autumn sunshine compared to the perpetual drizzle that seems to clothe the West Highlands at the moment. Last weekend the sky was blue and the sun was blazing down on the Brecon Beacons allowing me to walk a delightful linear route. This was from the Llia valley over Fan Nedd and along the high escarpment of Fan Ghyirych before dropping down to estate tracks and then joining the line of an old mineral railway high up on the side of the Tawe valley. 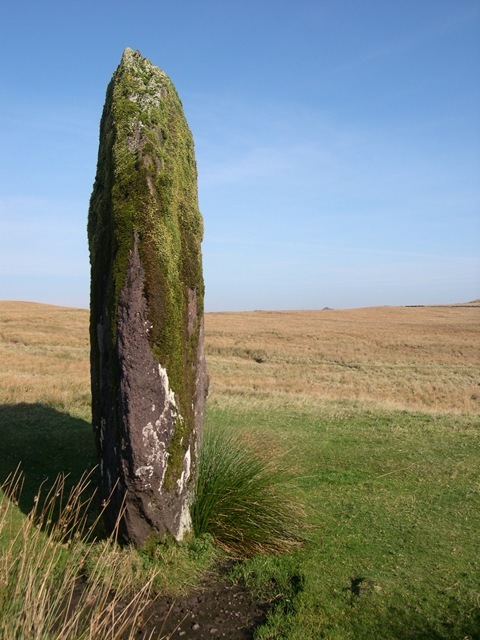 I started near the mighty standing stone of Maen Llia in the depths of the Brecon Beacons National Park. What made our ancestors place these huge monoliths? 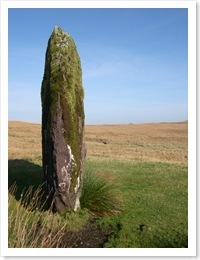 Why, along with their numerous burial cairns, were they placed high up in these hills? Why was this a significant place for the ancient Briton? Archaeologists and historians speculate and hypothesise but like much of ancient history, with the lack of documented records, it can at best be an educated opinion rather than stated fact. Leaving the standing stone behind I headed up over two fine peaks, only encountering two other walkers on the way. Then heading down to the line of an old mineral railway. that started high up in the hills by a series of small quarries before descending to the level above the hamlet of Glyntawe. The hundreds of miles of abandoned lines around our country are under utilised, admittedly many have been turned into paths or cycleways but many more lie forgotten and overgrown. This line I suspect was under-promoted although it was clearly shown on the map. For some reason part of it was left out of the open-access area indicated on the map although the open-access continued either side of the line. This potentially prevents anyone following its course along the full length of the valley. So I was “forced to trespass” by continuing along the line, although others had clearly preceded me, to my destination of Coelbren.